Excel Networking Solutions – the copper and optical fibre cabling infrastructure provider – is excited to announce that they will be exhibiting at a range of events and exhibitions across the world throughout this quarter. With the recent appointment of John Carrier as a new Country Manager for Australia - a market which boasts plentiful opportunities - Excel is looking forward to exhibiting at BICSI South Pacific 2018. On the 9th and 10th October 2018, a team of Excel specialists will be available at Booth 17 to discuss the latest products that have been added to the portfolio and the impact of the most recent updates to industry standards. 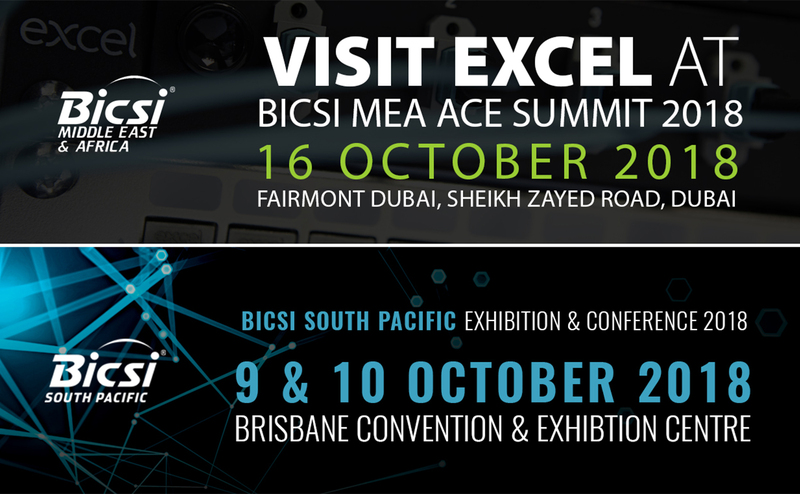 Further to this, on 16th October 2018 Excel’s MEA Regional Director of Sales - Krishna Thangavelu - will be representing Excel at BICSI MEA ACE Summit 2018 in Dubai, where a selection of the latest Excel products will be available to see and discuss. For further information about Excel Networking’s presence at the upcoming BICSI South Pacific and BICSI MEA Exhibitions, please visit the website or contact the respective Excel Country Manager; for information about the BICSI South Pacific event, please contact John Carrier, and for details about the BICSI MEA event, please contact Krishna Thangavelu. To find out more about Excel Networking, please visit our website or call our sales team on 0121 326 7557.